A chandelier makes any room look elegant and classy. You can now do the same with your lamp by creating a beaded lamp shade. For this project you can use your old lampshade or buy one at a thrift store. 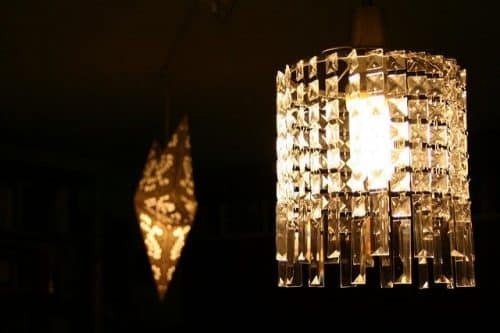 You should use your imagination and let your creative juices flow in this craft project as there are multiple ways to create a chandelier lamp shades beaded. The following one is fun, simple and easy to do. The first step is to remove the old fabric from the lamp so you get a better idea of the skeleton of the shade. Clean the frame and remove any old glue stuck to it. You can also spray paint it with a color that matches your bead color. You can either buy already linked beads or buy bags of beads and then thread it yourself. The latter gives you the opportunity to try out a variety of color and shape of beads to make your lampshade look more colorful. If you are creating this lamp for your kid’s bedroom then checkout the flower pendant beads that will be perfect choice for the shade. If you are threading the beads yourself then remember to leave enough thread on both the ends so that you can tie them to the top and bottom of the frame. Tie each string of beads closer or further away based on how dim or bright you want your lamp to be. Thus in a few easy steps you are able to recreate the magic of a chandelier with a lamp.